A couple of weeks ago I signed up to get a daily email with Time Out London‘s discount offers on everything from sporting events to restaurant meals to theatre and music performances. So of course I was thrilled when I saw an offer for £15 tickets to a London Philharmonic Orchestra concert on a Wednesday evening. 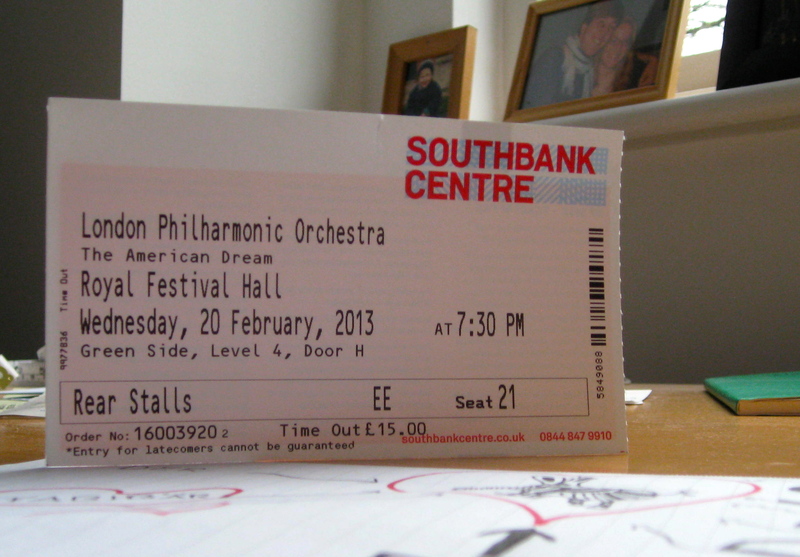 It was a steal for the excellent seats we had in the rear stalls of Royal Festival Hall. awesome seats for only £15! The concert was part of the LPO and Southbank Centre’s “The Rest is Noise Festival,” inspired by Alex Ross’ eponymous book on 20th century music history (I highly recommend reading the book). This particular concert was conducted by Marin Alsop, current Music Director of the Baltimore Symphony Orchestra, who is a petite but dynamic and crisp conductor. I enjoyed watching her, and she clearly enjoyed what she was doing. Overall, the concert and the experience were fantastic. 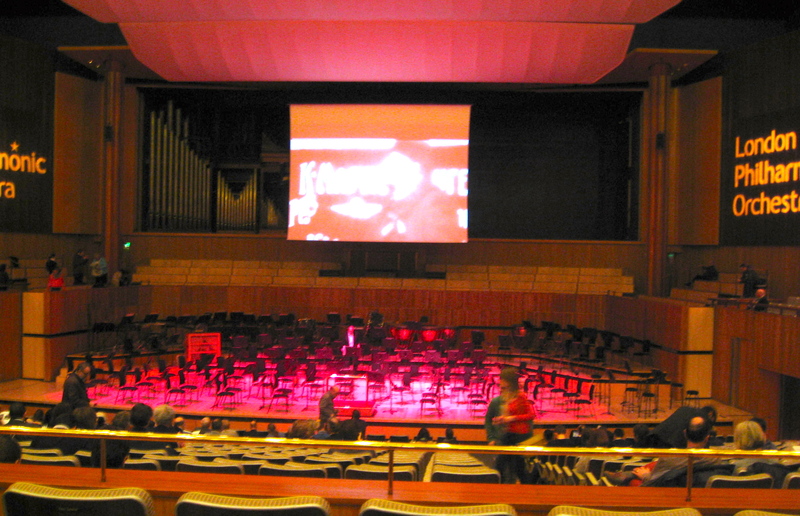 Royal Festival Hall is bright, modern, and open. The program we saw was called “The American Dream” and was all about America as interpreted through the eyes of European composers who spent time in the States around the turn of the 20th century. The program opened with the all-black London Adventist Chorale singing three spirituals, a Capella — smooth, rich, crisp execution and tight harmonies…beautiful. The third spiritual they sang was “Going Home,” which was given lyrics and effectively turned into a spiritual after Dvorak composed his Symphony no. 9 in E minor, Op. 95 (“From the New World”). The spiritual is based on the tune of the symphony’s second movement (Largo). As soon as the choir’s last notes died out, the orchestra launched directly into the “New World” Symphony, not allowing for applause. It was one of the best performances of Dvorak’s Ninth Symphony that I’ve witnessed (and I’ve seen it performed at least 4 times, the previous best performance being that of the Boston Symphony Orchestra at Tanglewood some years ago). The tempi were slightly faster than I’m used to — especially in the slow second movement — but the execution was so crisp that the quicker tempi didn’t bother me and, in fact, really enhanced the dynamism of the piece. The horns were fantastic and the low strings were brought out to reveal textures I had never known were there. Alsop conducted the symphony from memory. After intermission, Alsop spent a few minutes introducing us to each piece (she is an excellent speaker: clear, straightforward, super knowledgeable but makes the material accessible for music aficionados and amateurs alike). She explained the influence of jazz on Mihaud when he spent time in New York City; she described how he would sit in Harlem jazz clubs trying to scribble down what the musicians were playing. Jazz heavily influenced and inspired Milhaud’s La Creation du monde, actually a ballet based on African legends but performed at this concert sans dancers. It was a cool piece, scored for an interesting ensemble that included a saxophone and drum set. Parts of it felt improvisatory. The last piece was Egdar Varese’s Ameriques — HUGE orchestra (14 percussionists! 5 of each wind instrument! Double rows of horns!). Before the orchestra played the whole piece, Alsop explained the influence on Varese of Debussy’s Prelude to the Afternoon of a Faun harmonics (Varese takes the opening flute scale from the Debussy and reformulates it for the opening of Ameriques) and Stravinsky’s Rite of Spring rhythms. Alsop had the orchestra play a few excerpts from the Debussy and the Stravinsky, paralleled with the Varese, to attune the audience to the similarities. The piece itself was aptly described as “wild” by F. Loud, crashing at times, energetic (it depicts the streets of New York City in the 1920s), complete with (lots of) sirens. It took energy just to absorb all of the different sounds and motifs that are layered on top of one another. I was glad Alsop had given the introduction, because I was able to pinpoint many Stravinsky- and Debussy-esque moments throughout Ameriques. This entry was posted in Concert Review, culture, Highlights, history, music, pictures and tagged Dvorak, London Philharmonic, London Philharmonic Orchestra, LPO, Marin Alsop, Milhaud, spirituals, The Rest is Noise, Varese on 21.02.2013 by taplatt.